Mali is a multiple faces country. It has 4 “touristic” sites registered in the Unesco's World heritage List: the Dogon country of course, but also Tombouctou city, the great mosque of Djenné and, the tomb of Askia in Gao. While travelling through Mali, you will discover astonishing landscapes: sanded deserts, rivers, plains, mountains, luxuriant vegetation and arid savannas. You will be delighted by the cultural and architectural treasures of this country which was the historical cradle of the greatest Empires in West Africa. Bambara, Bozo, Dogon, Malinké, Moor, Peul, Sarakollé, Sénoufo, Songhaï, Tuareg… as many old ethnos groups which still keep their traditional lifestyles today. The common point ? An art to accommodate the traveller with smiling, open-minded and hospitality. All our guides, regional and national, are approved by the Ministry for the Craft industry and Tourism of Mali. They are 15 or 20 years old of professional experience in tourists accompaniment. They adapt to your rate, rhythm and tastes in matter of voyage. You can choose adventure or cultural discovery, foot or car travelling. We will take you through all Mali, do not hesitate to tell us about your project or to ask us an estimate for your own circuit. Gourma (Douentza): discovering the mountainous region Mali is like a journey into American Far West. Gourma is a wild and arid zone, a natural reserve for the last African elephants in the West area. Admire the mount Hombori and its pink dune, sleep under the "Hand of Fatma"
Djenné, Mopti and the Niger river: Mopti (also called "Venice of Mali") ride in a dugout to discover fishermen villages, head with us to Djenné to meet its inhabitants and admire its large mosque, the biggest mud-brick building in the world. Tombouctou and the desert: A legendary city yet true. It’s worth the trip. After two days of road or dugout, you'll enter the Tuaregs country. Have a ride on a camel back, sleep at Sahara frontier under the desert stars and meet the "blue men" and their caravans. Among many prestigious events, the spectacular "Degal” stands out. Registered on Unesco's Oral and Intangible Heritage of Humanity since January 2006, the "Degal" is a very particular moment for the Peul pastors living in the Niger delta. It's time for all their cattles to leave the arid land of Sahel for the flood plains of the inner Niger. On the choosen date, they all cross the Niger river at Diafarabe and Dialloube. Impressive. This is the occasion for the whole Peuls pastors community to gather together in a family and festive atmosphere. This traditional gathering takes place each year on the last November weekend or December first weekend. Feel free to write us, we will let you know the exact dates to attend this extraordinary manifestation ! 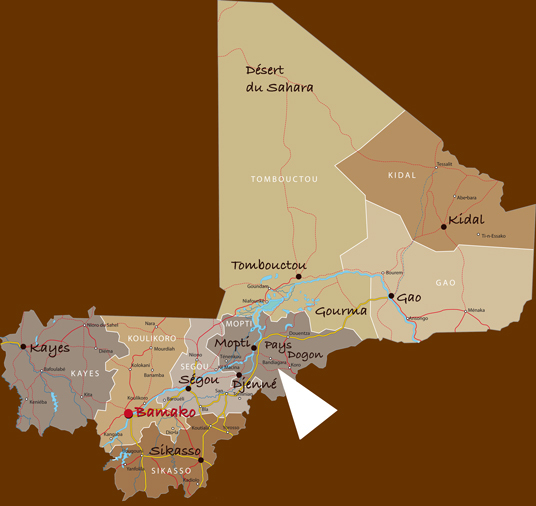 Among all the other famous festivals taking place in Mali, one can also mention the Desert Festival at Essakane-Tombouctou in January ; the Niger Festival in Ségou in February and the Puppets Festival in Markala (Ségou area) in March. We can provide organization and lodging for you if you wish to attend any of these festivals. Feel free to ask any information.